Batting cages are an excellent way of practicing softball or baseball. These cages can be installed at home, at a local park or a similar space. Cages gives batters the space to practice batting skills without requiring an entire field. When it comes to best batting cages for home use, you should go for safety and durability. Safety is a must-have with these cages as you don’t want the batter to hurt a passerby or someone standing close to the net. In this article, we cover the key considerations about batting cages. We also provide brief reviews about some of the best cages available for softball and baseball players. What is a Batting Cage? The Fortress Trapezoid cage features a very innovative design. This cage comes with galvanized steel frame. The steel frame is incredibly sturdy, power coated and rust proof. Thanks to its sturdy make, the frame can withstand powerful hits from the batters. 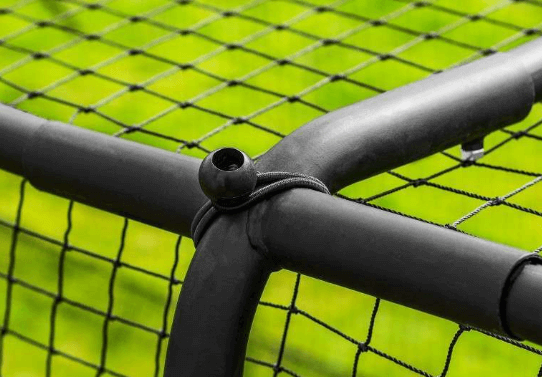 The netting on the cage features weatherproof and rot-proof 0.25-inch rope. The netting is strong enough to withstand the hits and absorb the shock without any major wear and tear. One of the stand-out features of this cage is its freestanding frame. The poles of the cage are positioned outside the net at an angle so that they there is no need for anchoring. This also makes it incredibly easier to set up the cage. The poled positioned outside the net further means that there is more space inside and that the poles sustain little to no damage from the hits of the batter. Fortress Trapezoid cage is available in multiple size options. These include 35 feet, 55 feet and 70 feet. The cage is 10 feet wide at the top, 14 feet at the base and features a height of 10 feet. The Baseball Batting Cages 42 is one of the most populated cage nets used across USA. This net is the hallmark of quality and durability. And it is perfect for you if you want to take a do-it-yourself approach towards building up your own batting cage. This net comes constructed from heavy-duty polyethylene material. Net World has used the ultra-strong rot-proof and UV stabilized poly variety in the construction so that the net doesn’t experience any major wear and tear over time. The overall design of the net also adds to its strength. It is created as a one-piece net with all the sides perfectly seamed together. On the edge, overlocked border rope is used to bring additional strength. The net is incredibly easy to hang, thanks to the aptly placed tie cord rope on all corners and down the mid section. 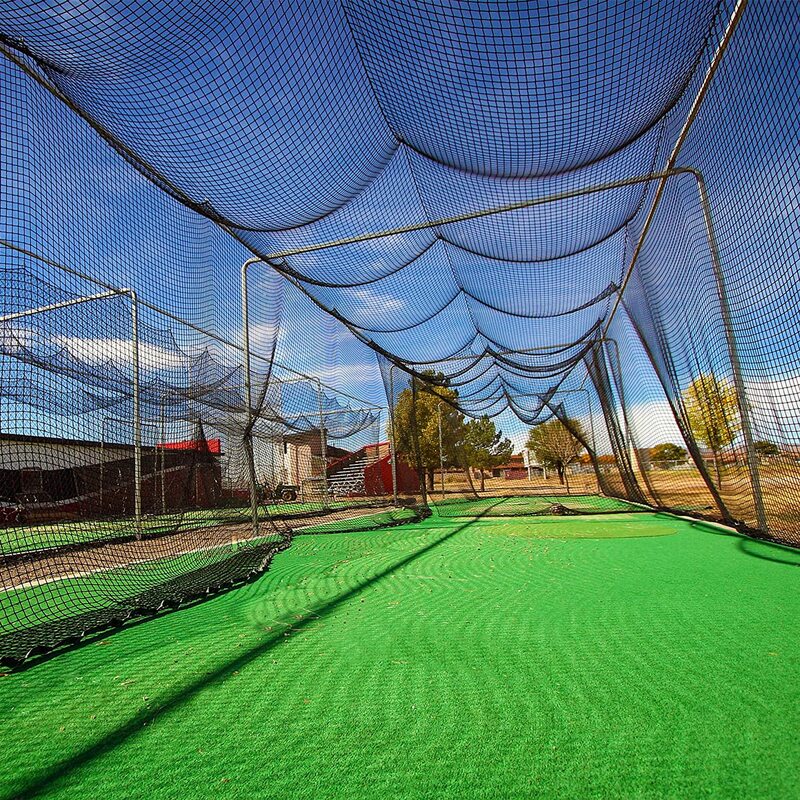 You can throw the net over any poles or frames of your choosing and create a custom batting cage that fits the available space as well as the practice needs of the players. The Ultimate Baseball batting cage line-up is a complete package that comes with nets and poles. This heavy-duty and sturdy cage comprises of steel posts that are ultra durable and powder coated. These posts are rather lightweight and easy to wield around, but at the same time they can handle direct player hits. The netting on this cage is weatherproof and UV treated so that it can withstand the weather quite effectively. The net has a one-piece design which adds to its strength and durability. The Ultimate cage is available in four size options including 20 feet, 30 feet, 55 feet and 70 feet. The 20-feet cage comes with 4 poles, the 30-feet cage with 6 poles, the 55-feet cage with 8 poles and the 70-feet cage with 10 poles. All cages are 10 feet wide and 9 feet high. The poles and net of the cage have a stunning black outlook which gives them a very professional look and feel. The Ultimate cage is perfect for players at various levels and is a great choice as a batting cage for home. 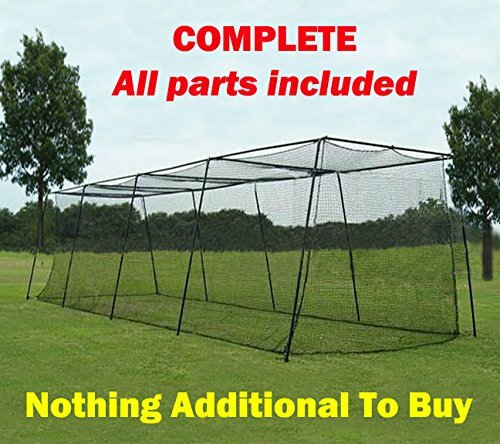 This batting cage from Championship Sports is a full package. It comes with poles, netting and related accessories required for setting up the cage. The poles and frame of this cage is constructed from heavy-duty galvanized steel. The great thing about steel poles is that they can take withstand direct hits from players without incurring any notable damage. Steel also bears up with weather conditions excellently. In addition to the side poles, this cage also features top support poles which add strength, stability and durability to the cage. Championship Sports has used #42 netting for this cage. The netting has been coated with UV and rot-resistant materials. So it can put up with outdoor conditions fairly well. The cage comes with a full accessory package that includes strike zone mat, L screen, stake kit and backdrop net. The L Screen ensures that a pitcher can practice pitching the same time the batter is practicing hitting in this cage. The backdrop net protects the netting from continuous baseball impact and prevents wear and tear of the netting. A batting cage is an enclosed area. It is square, rectangular or diamond-shaped. The cage is typically used by softball and baseball players to practice batting. At the same time, it can also be used by pitchers for pitching practice if the length of the cage is suitable and safe enough. It is usually enclosed within a high-quality netting which prevents the baseball or softball from leaving the cage when hit. This makes it safe for players to hit as hard as they want in limited space without hurting someone. It also eliminates the need for fielders who would fetch the ball as the ball, once hit, stays close to the pitcher or the hitter. Portable batting cages, as their name suggests, can be carried anywhere. These cages do not require concrete footers, so you can pitch them at a park, a picnic spot, a hill or virtually any other place with sufficient space. They are quite convenient but compared to standard cages, they have their pros and cons. The overwhelming advantage of a portable batting cage is simply that is it portable. You don’t have to anchor it once and leave it there forever. Instead, you can pitch up the cage, do your practice hitting, and then simply undo it once you are done. This way, you can essentially pitch up and then undo the cage every time you go training. This is particularly useful if you don’t have a fixed spot for pitching the cage and need to move around often in search of a suitable spot. Another frequent upside to portable cages is that they have a smaller price tag. Compared to standard batting cages that are fixed, portable cages are less stable. This is simply because they are not permanently anchored into the ground. Although many portable cages come with sturdy anchors, they are still susceptible strong gusts of wind which may bring down a portable cage. So you really need to do your homework before you purchase a portable cage. Ideally, go with one that has plenty of anchors and a proven record of resisting high-speed winds. The Jugs Lite-Flite is one of the best batting cages out there. This portable cage stands out for the fact that it offers strong lateral support. This ensures that once it is in the ground, you can rely on its stability even in adverse weather conditions. Jugs Lite-Flite is incredibly easy to set up. It features bungee fiberglass poles and excellent nylon netting. In all, the cage takes only 15 minutes to set up. The nylon netting is manufactured to be exceptionally sturdy and ensures that the cage is safe. The cage has an arch-shaped design instead of a regular rectangular or square design. This ensures that it offers maximum space both in terms of height and width, giving the batter plenty of space to hit freely. One side of the cage’s netting carries a small opening for the pitching machine. You can simply position the pitching machine in front of the opening and let it do its work. 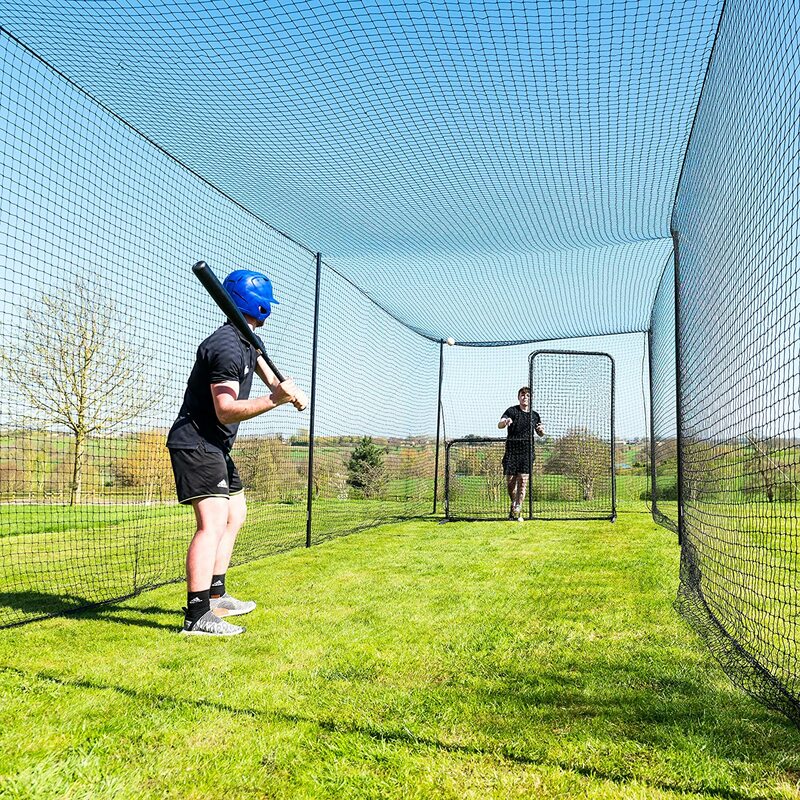 Perfect for batters aged 12 and under, this portable batting cage is an excellent way of creating a suitable space to practice batting skills anytime, anywhere. When you are looking for batting cages, you have a choice. You can purchase a permanent batting cage that is cemented to the ground. Alternatively, you can go with a portable cage that is more temporary and can be set up or taken off quickly and easily. Both types have their pros and cons. Permanent cages are more sturdy and heavy-duty. They can withstand the weather perfectly and will serve you as an excellent long-term solution. That being said, you need a permanent place for them. So they are going to occupy a specific portion of your lawn or another space for good once installed. Permanent cages also cost a tad bit more. In contrast, portable cages can be set up in as little as 15 minutes. You can carry them anywhere and pitch them anywhere you want. They don’t need a cement footing, so you don’t have to fuss about the kind of ground in which you set them up. This also plays to their disadvantage because portable cages are not as strongly anchored as permanent cages. So they are susceptible to strong winds and weather conditions. In gusty weather, they may be yanked off the ground. A possible solution is to take them off in adverse weather and set them up once the coast is clear. 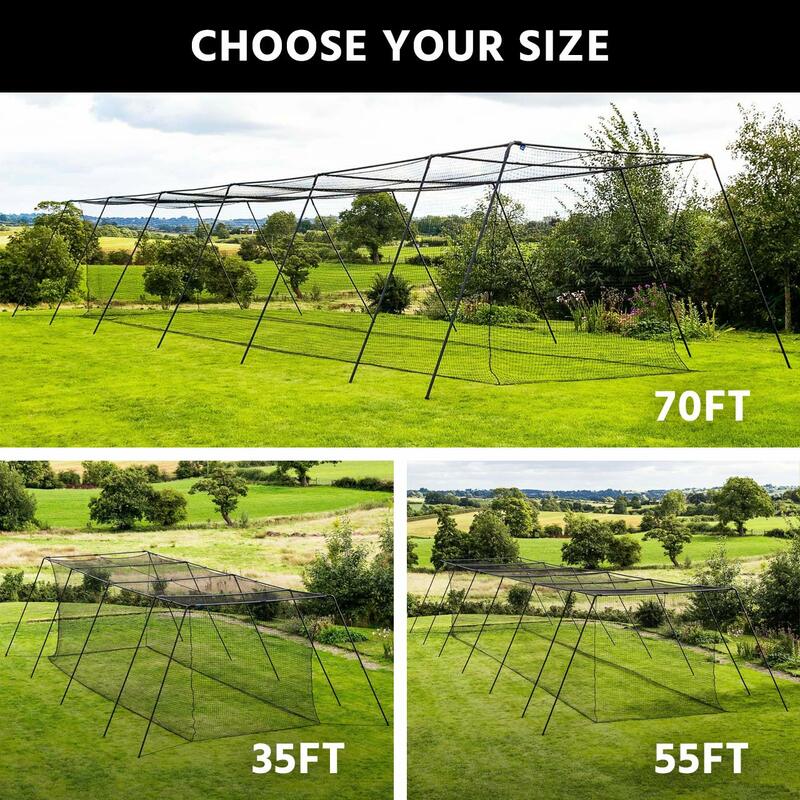 Size is a vital important when purchasing a batting cage for home. You don’t want to purchase a pole that is simply not going to fit at your yard. This is why is it important you measure the space that is available to you and then purchase a cage that is sized accordingly. In general, batting cage sizes start from 20 feet in length and go all the way to 70 feet or 80 feet. If you are purchasing the cage for a younger place, a cage with a smaller length will suffice. At the same time, if the cage will be used only for hitting practice and not for pitching practice, a smaller cage will work fine. However, if the batter is a high school player or if the cage will be used by both a batter and a pitcher, it needs to have suitable length, around 60 to 70 feet for high school players. This helps ensure the safety of the players and provides them ample space to practice their skills. Batting cage nets typically come in two varieties – polyethylene and nylon. Both have their pros and cons. Nylon is incredibly sturdy and will serve you in good stead during practice sessions. Even when it is less thick than a polyethylene net, a nylon net is stronger. However, nylon has a tendency to deteriorate rapidly. So if you pitch up a nylon cage outdoors, the rain and the sun will cause wear and tear to the nylon net very quickly. In contrast, polyethylene nets may be slightly thicker and heavier than nylon nets. On the upside, they can withstand the weather conditions really well without incurring any significant damage. So if you are going to use the cage outdoors most of the time, or if you live in an area with high air moisture, you should prefer a polyethylene net over a nylon net. Batting cage frames come constructed from various materials. Most notably, fiberglass and steel are used in their construction. Fiberglass batting cage frames are incredibly easy to set up. They cost less, require little to no tools for setting up, and you can set them up in minutes. On the downside, they are not strong enough. They are susceptible to rain, winds and even a strong hit from a batter. Cold weather can damage fiberglass frames and create cracks in them. Steel frames, in contrast, are significantly more heavy-duty and sturdy. They can withstand the cold weather and the hardest of hits without sustaining any damage. They cost significantly more than fiberglass cages and you need to put some time and effort into them when setting them up. Another option is fiberglass frames with steel rods. Compared to fiberglass frames, the only advantage of these frames is that they can withstand hard hits from the batter. This is because the support poles in these frames come with steel reinforcement. These frames are also easy to set up and take down. They cost slightly more than fiberglass frames but significantly less than steel frames. Portable cages are easier to set up. If you are using a portable cage with fiberglass frames, you can expect to set it up within 15 to 20 minutes. In contrast, a steel portable cage takes around 2 hours to set up. Permanent cages that are fixed to the ground take significantly longer. You can expect 1 to 2 days of set up time in their case. Portable cages in general allow you to quickly set up and take down the cage. Permanent cages take a long time to set up but once firmly installed, they stay in good shape for a long time. The right batting cage really depends upon the age and level of the players, the available budget, indoor or outdoor use and numerous other factors. This is why we have brought together a diverse collection of the best backyard batting cages in our reviews above. If you want a neat batting cage for home with the essential basics, the Fortress Trapezoid is a great option. On the other end of the spectrum is the cage from Championship Sports which features the basics and then virtually all the additional accessories as well. If you want something that you can absolutely rely upon and that features a famous brand, the Net World Sports cage is a good choice. 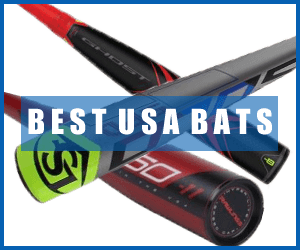 The company has a USA-wide reputation of offering some of the best batting cages available on the market.